Comfortable and functional, Spectator will make your relaxing time more entertaining with four, lighting cup holders to keep drinks close at hand. Enjoy snacks on the storage console's wood table surface, also equipped with additional storage in the pull-out drawer at your feet and cupholder console storage compartment. Great looking too, with contoured back cushions, chaise seats and single-needle topstitched detailing. Lean back and relax with soothing, power-reclining motion. See the complete Spectator line for more reclining options and additional matching pieces. The Spectator 5 Pc Reclining Home Theater Group with Power Recline+ by La-Z-Boy at AHFA in the area. Product availability may vary. Contact us for the most current availability on this product. 4CS784 Storage Console 2 15.5" 38.5" 34.5"
4SH784 La-Z-Time® PowerRecline+ Armless Recliner 1 23.5" 39.5" 44.5"
4AH784 La-Z-Time® PowerRecline+ Left-Arm Sitting Recliner 1 33" 39.5" 44.5"
4BH784 La-Z-Time® PowerRecline+ Right-Arm Sitting Recliner 1 33" 39.5" 44.5"
Padding & Ergonomics High-resilience foam comes standard, but La-Z-Boy Memory Foam Cushion with Qualux foam base is also available. You're all about entertaining and making every get-together a memorable one. Whether your planning to host Monday night football parties, girl's movie night, or the kids' sleepover party, you want the entire crew to feel comfy and welcome at your place. That's why we designed the Spectator group, to provide comfortable, reclining furniture options for every room and every size space. Configure a reclining sectional for your home theater area or living room, equipped with storage sections or lighting cupholders. 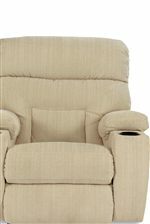 Or, add the pleasing comfort and relaxation of a Spectator recliner to your existing living room set-up. These multi-function reclining sofas, sectionals, and chairs aren't only comfortable, but they boast long-lasting function and durability you can enjoy for years to come. Customize your reclining furniture with optional brushed metal recliner handle, elongated handle, extra-tall base, extended legrest, or left-side handle to better meet your personal needs. The Spectator collection is a great option if you are looking for Casual furniture in the area. Browse other items in the Spectator collection from AHFA in the area.